While many organization and individuals are interested in investing in emerging markets, most do not fully understand how various segments and strategies vary in the exposure they provide. Before committing to a strategy, it’s vital that investors do their due diligence to understand what their options are, how they differ, and which will deliver the exposure they think they're getting, as well as the optimal results. 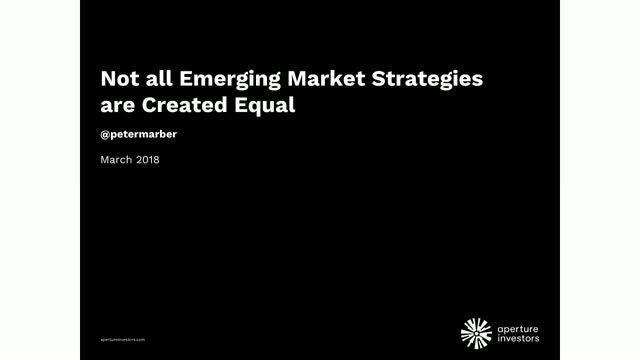 In this webinar, Peter Marber will clarify what various strategies really mean in order to enable a true risk/reward analysis on the part of EM investors. Peter Marber is the Chief Investment Officer for Emerging Markets at Aperture Investors, leading the New World Opportunities strategy. For over 30 years, Peter has professionally invested billions of dollars for many of the world’s largest companies at firms including Loomis, Sayles & Company, HSBC, and Wasserstein & Co. Though a globally-recognized authority on emerging market economies, Peter landed on Wall Street not because of his love for financial markets, but rather due to his fascination with globalization. Peter studies how countries and their markets evolve to develop a deep understanding of emerging market dynamics. He passes along his curiosity, knowledge and passion as a professor at NYU, Johns Hopkins, Harvard, and Columbia, as well as through his writings on globalization, emerging markets, and higher education. Peter earned his B.A. at Johns Hopkins, his M.I.A. from Columbia, and his Ph.D from The University of Cambridge. He is an avid composer and guitarist and lives in New York City with his family.